Huge Savings Item! 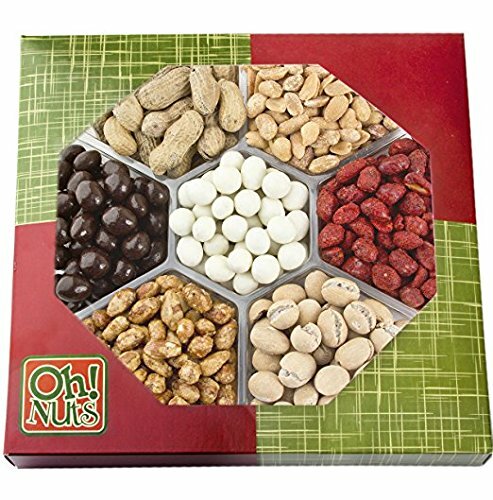 Save 11% on the Fathers Day Nut Gift Basket, Holiday Gourmet Christmas Food, Peanuts Variety Assortment, Send a Prime Tray for Man, Woman & Families for Thanksgiving, Birthday & Get Well Care Package - Oh! Nuts by Oh! Nuts® at 365 Days Of Kindness. MPN: 73048. Hurry! Limited time offer. Offer valid only while supplies last. When it is time to send many assorted gifts to many people, you want to find an economical way to send those gifts without compromising on quality. Nut flavorings in this delicious nut tray: Sugar Toasted, Kabukim, Au' Natural in Shell, Chocolate Covered, Honey Glazed, Chef's Blend (similar to BBQ), and Yogurt Covered.